Stella just wants to help her family gain back a semblance of the sanity they lost when they sacrificed everything to care for her during her struggles with cancer. That’s quite a laborious task to take on, especially considering that it’s only been a week since she was declared cancer-free. But she’s determined — and apparently when Stella Abbott is determined, absolutely nothing can get in between her and finishing the task at hand. I would classify this as the main plot and underneath this umbrella are a few key subplots: namely a tension-ridden war between Stella’s parents, Ida and Paul, and that Stella and Wes’s marriage is threatened by bureaucracy. Basically, they didn’t get a legitimate marriage license for their shotgun wedding because they thought Stella was going to die, so a U.S. immigration agent wants answers. And finally, this episode answered the question of, “Why doesn’t Ida Abbott seem to care that her family is falling apart?” Well, we find out it’s because everything in the past — Stella’s cancer and the secrets that lead to the downfall of her marriage with Paul — causes her a tremendous amount pain, which is pain she’d much rather avoid. Anyone in her position would feel the same. That’s why she hides out with Poppy: Because each crevice and corner of the Abbott family house holds a memory of the cancer that brought turmoil to this family. Yes, they had happy, wonderful memories, but the miserable ones are somehow embedded into the foundation of their home. Ever read Edgar Allan Poe’s The Fall of the House of Usher? This situation is very loosely like that story; their family home is an allegory for the fall of their family. Ida wants to tear the house down. If she tears the house down (literally, because she tried to ax one of their walls), then the family and the mess they have become can be torn down with it. It’s interesting storytelling logic, but it’s a little too Gothic for The CW’s tastes. So Ida settles for selling the house, and they do get an offer — an offer however that Paul cannot agree with. Paul considers their home to be worth so much more than a price tag and insists that they wait for a better offer, or even keep the house (which Ida is vehemently against). All the while, Stella tries and fails to mediate. She ends up siding with her dad because of the anger she feels toward her mom walking away from her childhood home. But she’s unable to truly understand the motives behind her mother’s actions. I initially took Paul’s side as well, since the audience was kept in the dark about Ida’s reasoning and behavior, which made her confession toward the end of the episode a vulnerable one. Meanwhile due to their marriage being under investigation, Wes and Stella face the possibility of Wes being deported back to the U.K. He implores Stella to come with him, but she hesitates. Leaving home would mean leaving her family — and her family comes first. This is something that even Wes realizes: Stella’s family gave her their lives for nine years, and Stella was only just starting to do the same for them. So leaving now would be a disservice to her family and herself, as much as she loves Wes. At the end of the episode, Stella tells Wes that she would have gone back with him if she had to. However, the audience is left to consider that she probably wouldn’t have. She’s too grounded in her role as a daughter and sister, and I think she considers those roles to be her most vital; she sees them as her drive to live again. Wes is another drive, but not her main one, and I think that prioritization is refreshing. I mean, how often do we see characters prioritize their families over their romantic partners — on-screen and in real life? And what’s just as refreshing is the change in the stereotypical parental dynamic: Instead of Paul or the dad being the one out of the house with a new life, ready to move on, it’s Ida or the mom we get to see function in this aspect. I’ve often observed that in popular media it’s the mom and not the dad in these situations who is a victim, struggling to fight their way back to stasis. But that isn’t the case here and it makes for a wholly engaging story. Frankly, it’s such a fascinating dynamic between the parents, and between them and their children and sons-in-law. I’m excited to see what other role reversals the writers forge. 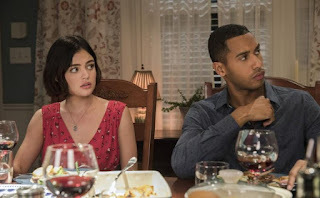 As for the other other two minor storylines, Aiden struggles with talking with Marlene — the married woman he got pregnant. He finally does, after almost losing Stella’s confidence. Yes, talking to her would create even more of a mess, but at least he’s being honest. And honesty looks good on Aiden, a seemingly-silly character who has surprised me with his earnestness. Lastly, Stella convinces Lizzie to invest in herself and pursue writing. So she helps her re-enroll in the relevant coursework. This sends Lizzie away from her family. But Stella promises Diego (Lizzie’s husband) that she will help him and Lizzie’s kids (Fiona and Frank), and that it’ll be no problem. I foresee that it’ll in fact be a huge problem, but hey, Stella is strong and motivated by her own intuition of goodness. She’ll figure it out how to do this balancing act if it’s for her family. I just genuinely hope she finds time to reflect on herself. It seems that she doesn’t yet recognize that she went through her own personal turmoil. Though, perhaps lending her family her cosmic strength is one way of recognizing this, by acknowledging and understanding the trail of memories, both good and bad, that her cancer left behind, she will heal along the way. Beyond any doubt, I believe that the Abbott family house isn’t what holds them together like Paul thought, or what tore them apart like Ida thought. It’s not the house at all that does anything for this family’s fortitude. It’s simply their love for each other that keeps them still and standing strong despite every terrible thing that’s happened to them. Their love appears to be a powerhouse. Wes has a law degree? Something in finance? Also, thanks for the brief glimpse into his backstory, writers room. Would an immigration agent knock on your door in 2018 to legitimize a marriage license? They would likely email or call. But for the sake of drama, I guess it makes sense. “Not even the United States government is gonna come between us.” Okay, but they might though. “Leave your drama at the door. Work is for work — not socializing!” I like Stella’s boss. I’m enjoying the narration. It’s cute! Okay, the clothing and makeup departments did a great job of making Lucy Hale look like a teenager. Lucy Hale’s British accent is so dorky and I love it. I like the dynamic between the three siblings. Aiden sounded really familiar to me during the pilot and I finally realized that he sounds exactly like my stoner station manager of the radio I used to intern at during my sophomore year of college. Stella saying, “I feel like a sad raisin” after her bath? I’m cackling. This was such an emotional episode, but it’s chicken soup for the soul, I swear.